Winter is the perfect time for warm and comforting baked pasta dishes. This recipe from Paragary’s Bar & Oven utilizes this season’s fresh squash and leafy greens to create a savory dish that’s ideal for dinner parties or meals at home with family. The recipe contains no meat, just chicken stock which can be substituted with vegetable stock to make the dish vegetarian. Cut squash into ½” cubes and toss with a little olive oil and salt. Roast squash in oven at 350 degrees until very tender and lightly browned. Saute the onions in olive oil over med heat until soft and lightly browned, 15-20 minutes. Add the sage and cook briefly. Add the cooked squash, chard, and chicken stock and bring to a bare simmer. Add the cooked pasta, butter, parsley, and Gruyere and mix well with a wooden spoon. Season with salt and pepper. Place the pasta in a baking dish and grate Parmesan over the top. Bake pasta at 350 degrees for about 10 minutes. Remove dish from the oven and sprinkle the breadcrumbs over the pasta. 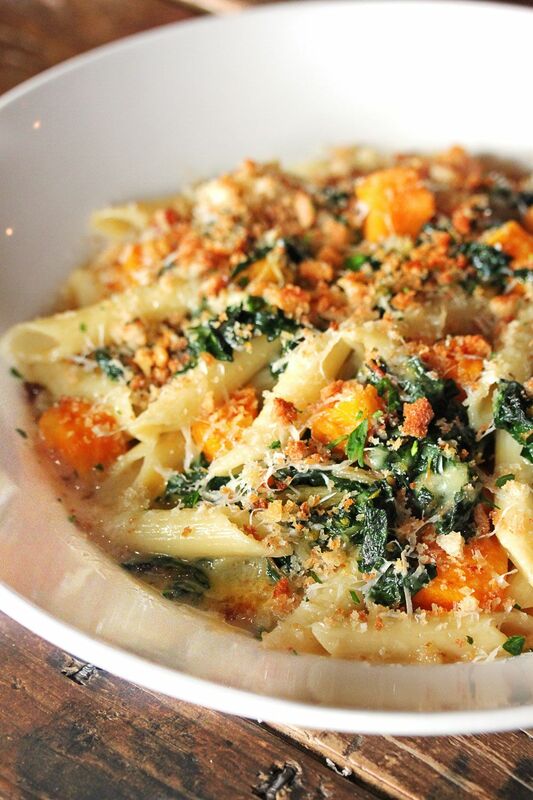 Serve with additional breadcrumbs to pass at the table.